I wanted to warm up the lemons, so I used a wet mixture of Burnt Sienna and a touch of VanDyke Brown to add to the shadow areas. I continued on with this color to develop more of the darker values in the glass bowl. On the right side of the top part of the bowl I added a pretty strong value of the background mixture because at this part of the bowl the background shows through the glass. 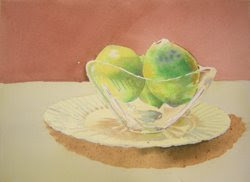 I also glazed some New Gamboge, very wet, on the lighter areas of the lemons.